Growing your own fresh shrooms only takes a little bit of effort. 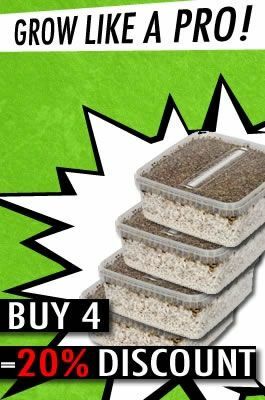 View our 100% mycelium mini grow kits, which have a volume of 600cc. These are perfect for beginners or people who want to try a new type. Review our selection on this page and you may even start growing your own shrooms soon! Growing magic mushrooms is a bit easier than you might think. The 100% mycelium mini grow kits have been developed to an extent that many of the difficulties have been resolved. But what is mycelium and what does it mean when a grow kit is 100% mycelium? Let’s take a moment to explain. Mycelium is the network of hyphae (fungus strands) that is underground. This is what mushrooms grow from. 100% refers to the presence of potential shrooms. A grow kit with 100% mycelium offers you the maximum potential for a great batch of magic mushrooms. If you are going to grow shrooms yourself, make sure everything is sterile. Wear clean clothing and use a face mask, disinfecting agent and gloves. Any bacteria that you have on your person can ruin your harvest. It is important that you keep everything as sterile as possible during both the cultivation and the harvest. Place the grow kit in a bright location, but not in full sun. Artificial light or daylight is best. Be sure that the temperature of the grow kit remains stable: between 20 and 25 degrees Celsius. Read the product descriptions and the inserts to know exactly how to handle the cultivation and harvest. This is different for every type of shroom. One type may call for more time and care than another. It is always possible that you will have shrooms left over after your first trip, because a trip only requires about 10 grams worth. Fresh shrooms can be stored for up to several weeks in the refrigerator. Do you want to keep them for longer? If so, then you must dry them out and place them in a dark, dry location. Do you have questions about using or ordering these mini kits? Please feel free to contact us!